We recently tried the Homedics Restore Water Purifier and Sanitizer. Based on the included documentation, it’s a good choice if you have concerns about the cleanliness of the water in your area. At the same time, we found there was no discernible taste difference between water purified by the Biomedics model versus our old fashioned Brita filter. 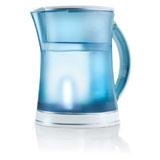 The Homedics “machine” is a new water filter on the market and provides both Brita-style filtering of water as well as ultraviolet light sanitization. The Homedics unit is proven to kill 99.9999% of bacteria, 99.99% of viruses and 99.95% of microbial cysts every time with a special UV bulb that will always deliver the required kill rate and will not f ade over time. At the same time, water purification and sanitization are extra steps that require some dedication and may seem more bother than they are worth, again if your water supply is very safe. Purification requires pouring water into the reservoir and letting it go through the filter two times before the 8 cup container is full. Then, you need to flip a switch to allow the sanitization feature that cleans the water to work, after which you push another button to turn on the electric light which is plugged into the wall. All this is a bit of effort if you have a family drinking multiple quarts of water each day. UV sanitization does have many advantages over chemical sanitization, as reported by the National Drinking Water Clearinghouse. • Improves the taste of water because of some organic contaminants and nuisance microorganisms are destroyed. 1. The lid fell off onto the counter as we tried to pour the last few drops of water into our glass. This appears to be a design flaw. 2. While the manufacturer has gone way out their way to install a fail-safe system into the machine so it won’t appear to sanitize if the bulb mechanism is not working, there is no way to verify if each human operator has sanitized the water. If you did live where clean water is a significant issue, this would be cause of major concern. At about three times more for the sanitizer feature (vs Brita) and the added hassle to make it worth it, you should weigh the value in your area.